Enjoy a great opportunity of getting to know Brazil! Help us promote our aqua park! Ayuda en hostal y ven a maravillarte de Valparaiso! Nos ajude nas tarefas em nosso hostel! Open positions at our beautiful hostel! Join our awesome crew in Santiago! How to travel and work in South America? The work exchange is a unique experience for travelers that want to immerse themselves in South American culture. 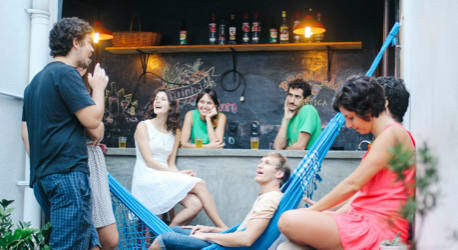 You can exchange work for accommodation in hundreds of hostels, inns and home-stays spread throughout Brazil, Argentina, Chile, Colombia, Ecuador, Peru and other countries on the continent. Live the daily lives of locals, develop new skills and have an unforgettable travel experience! South America is the ideal destination to travel alone and meet a new group of friends. Most countries are already part of the worldwide route that backpackers take, usually spending 3 to 6 months traveling from the north to the south of the continent. If you are looking for an experience to work abroad to learn Spanish first-hand, there are diverse exchange opportunities in hostels, homestays and local inns.